Based on data collection, Eulerian’s suite offers you a solution to fulfill key digital marketing needs in real time, such as analytics, cross-device attribution, DMP (Data Management Platform), data activation and TMS (Tag Management System). With Eulerian’s technology, it is possible to make the most of your data as they give you the tools to build and customize your data set without any flaws. Eulerian collects and centralizes your online and offline marketing data in real time, on a single interface. All the data is then compiled at a user level, regardless of the device in use (computer, tablet or smartphone). Eulerian’s technological choices provide you with the most reliable data collection and storage capacities on the market. Having access to your dataset through the Eulerian TMS also allows us to leverage your customer data and segments across their entire journey, ultimately enhancing your results right out of the gate. 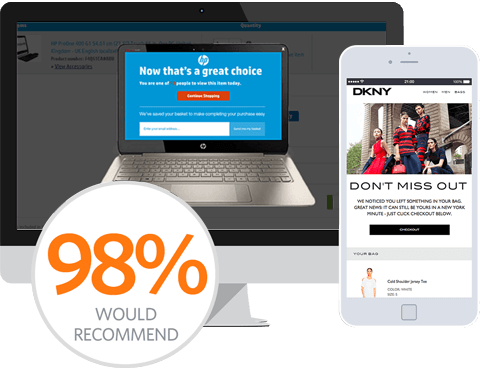 SaleCycle will study your audience and define segments which ultimately helps to optimize your results from day one.